Before we get into my itinerary, there are some practical matters to discuss – admission tickets, train stations, etc! 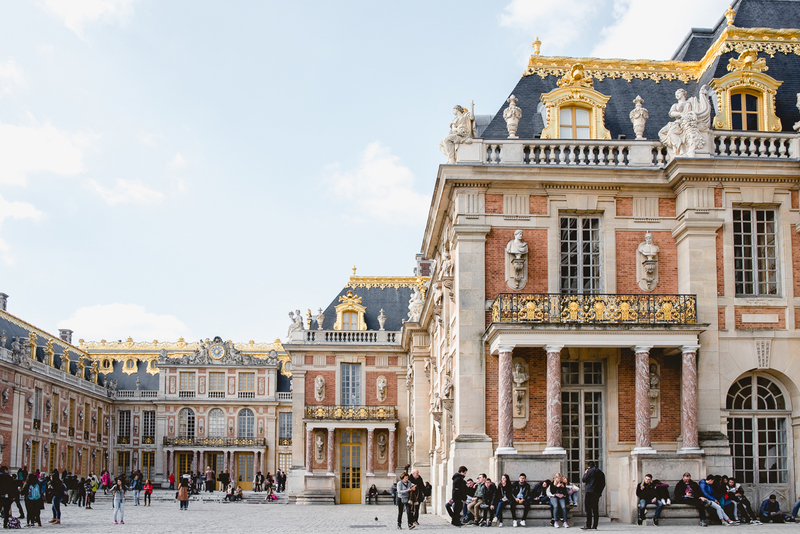 You can get a nice overview on the Versailles website here as well. You’ll have to line up for a security check no matter what, but you can at least avoid ticket lines by purchasing ahead of time online. Click here for all the ticket options. If you want to see EVERYTHING, get the Passport ticket. If you want to skip the main chateau (it can be absolute hell during super busy, hot summer days, especially if you get anxious around crowds and tight, humid spaces), then just buy separate tickets for the Trianons and Garden. The good thing about my suggested itinerary is that you won’t be visiting the main château until later in the afternoon, so hopefully that will mean less of a security line. I’ve noticed they added a Passport ticket option with timed entry to the main palace. The point of this ticket is to cut down on wait times with a priority entrance. The earliest time slot is 9am, the latest is 3pm. With my itinerary, 3pm might be cutting it a little close time-wise, but you can make your own decision depending on your preferences. One thing to keep in mind are the “special” garden days – Musical Fountain Show and Musical Gardens. On specific dates from April to October, they play Baroque music and/or turn on the fountains in the main garden. On these days, entrance to the main garden costs extra, but it is already included in the regular Passport ticket. You can read more about these special garden days here. Versailles is in zone 4, well outside of the Paris metro system. Therefore, regular metro t+ tickets won’t work in Versailles. So… what sort of train tickets should I buy? You have many options. The simplest options are either to buy a pair of Point-to-Point tickets (just select your departure and arrival stations for a particular trip and the machine will calculate the cost for you, or buy at the ticket window), OR you can buy a Mobilis ticket that lasts all day long and allows unlimited travel within a range of zones that you choose. Other options include a Ticket Jeune Weekend if you’re under 26 years old and it’s a Saturday or Sunday, a Paris Visite tourist ticket, or a weekly or monthly Navigo Decouverte pass (trickier to acquire). The Navigo Découverte travel card can be used by anyone (with no obligation to live or work in the Île-de-France region). Obtain your Découverte card immediately in all our metro and RER stations or from an RATP authorised retailer. Personal data provided by the cardholder is not kept in the RATP customer database. The Navigo Découverte travel card costs 5 euros. The Découverte travel card is nominative and has an ID photo (25x30mm format). It is used to load Navigo monthly and weekly travel passes. If your Découverte card is lost or stolen, you must purchase a new Découverte card and travel pass. For a list of all the ticket types, click here. And if you have a specific situation and would like my advice, you can always send me an email. Also, the Versailles website has some awesome information. Check it out here. OK! Now that we have all the boring, tedious information out of the way, I can share with you my perfect itinerary in Versailles. It will take you on a 6+ mile-long tour of the city and estate grounds, so wear your most comfortable, least attractive shoes. 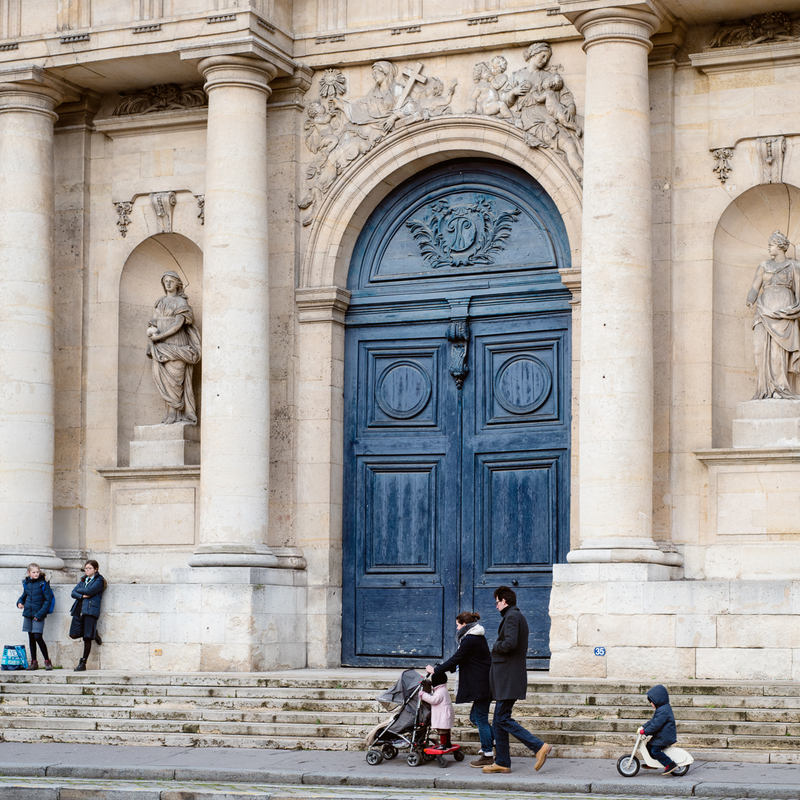 This walking route is for those who want to approach Versailles a little differently. It’s for those who love to wander, who want to see a little bit of the local city and culture rather than just zero-in on the pure tourist stuff. Most tourists come in and out of town via the train station called Versailles Rive Gauche, but my itinerary shakes things up. I’ve designed it so that there is zero backtracking, because I hate backtracking. I’ve included a few timing notes below, but of course it all depends on how you modify the itinerary, how fast or slow you walk, and any random closures or unforeseen circumstances you might encounter. Details and specific locations on a map are listed further down this post! When I lived in Versailles, our apartment was about two buildings over from this market square, and I really miss it! It’s surrounded on four sides by covered halls that also contain market stands every day, but the open-air part of the market only runs on Tuesdays, Fridays, and Sundays from 7am to about 1:30pm. Info here. I would suggest picking up whatever fruit is in season, a couple wedges of cheese, some sliced saucisson, a handful of nuts, and maybe even some marinated olives. For a baguette, croissants, and pastries, I would suggest visiting Maison Guinon (it’s marked on the map below), my favorite boulangerie in the area. It can get a little busy on market days, but here’s a tip: French people aren’t good at lining up, but there are always two sort-of disorganized lines inside the bakery, one line for the fancy pastry and sandwich case and one line for the bread and viennoiserie case (aka baguettes, croissants, pain au chocolat). So, if you DO want fancy pastries or sandwiches, start in that line FIRST, then make your way over to the bread area to pay. Don’t worry too much about “cutting” in front of people – that concept doesn’t really exist in France. 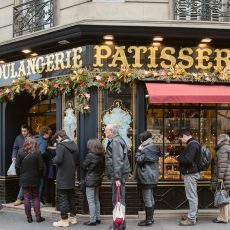 There’s a method to the madness of a French boulangerie… it’s organized chaos. Just go with it, smile, and don’t forget to say Bonjour and Merci! NOW for my BEST KEPT SECRET of Versailles. The Crêpe Lady. I’m not joking when I say that her crepes are the best ones I ever ate in France. I even traveled to the birthplace of the crepe and they weren’t as good as hers. I can’t remember her name (i know, I’m terrible), but you MUST get one from her. They’re not the mushy crepes you get at every other crepe stand in Paris, they’re cooked in salted butter, and paper thin but slightly crispy on the edges. For a sweet snack, I always get the Speculoos crepe (aka Cookie Butter at Trader Joe’s). For a savory breakfast snack, I always get the Complèt crepe (egg, ham and cheese). Find her crepe stall at the southwest corner of the covered halls. Specific location marked on the map below! In my opinion, the best part of Versailles are the two Trianon palaces and Marie Antonette’s Garden, which is why I always prefer starting the day off with them. 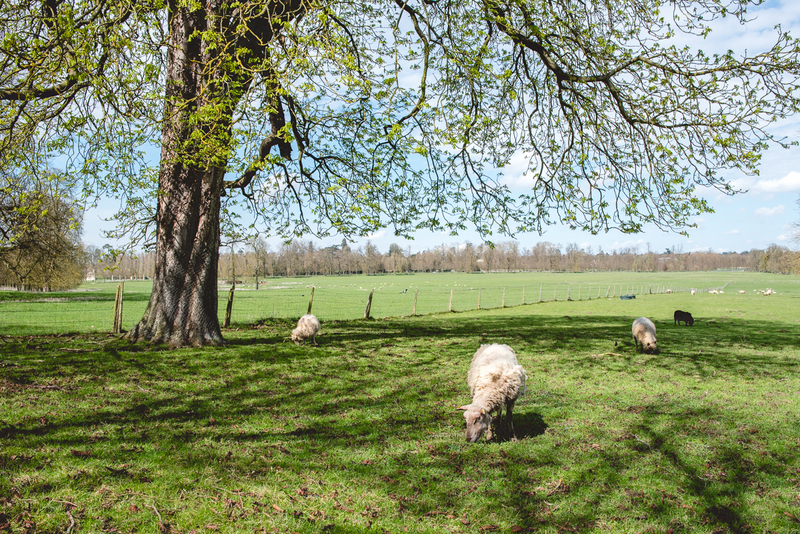 Entering through the gate along the Boulevard de la Reine will allow you a peaceful walk alongside fields of grazing sheep, and it’s so refreshing to feel like you’re out in the middle of the countryside after the craziness of Paris. Plus, most people don’t do Versailles in this order, so you should have the Trianons mostly to yourself! This pathway runs outside of the main gardens and is completely free to enter. There are no hedges or marble statues, just open fields and long rows of trees. 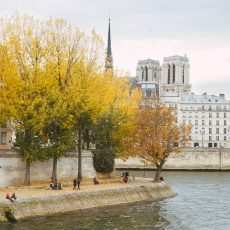 The free portion even includes the Grand Canal, so if you’re looking to just go for a refreshing walk, the Boulevard de la Reine entrance is a great starting point. Last time I was there, bike rentals were available here. 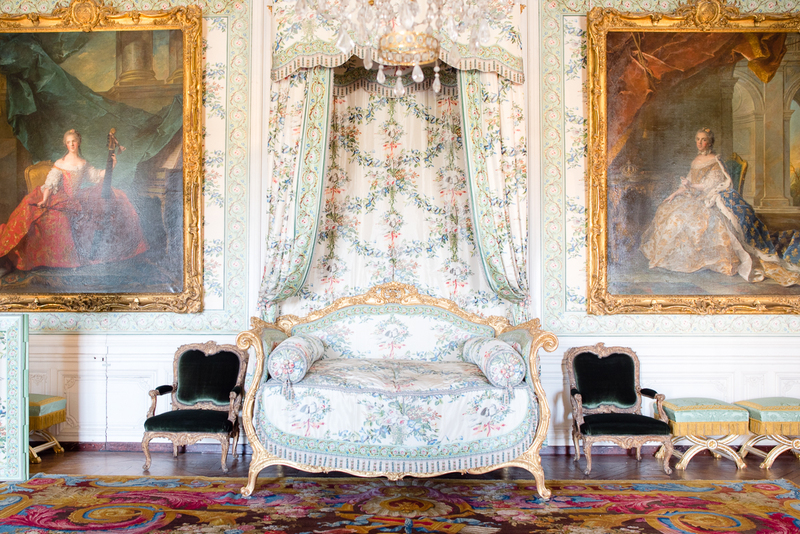 Think of the Petit Trianon as Marie Antoinette’s house. Although not originally built for her, she sort of took it over and made it her own, since she strongly disliked of the rigidity and public exposure of life inside the main château. It’s still magnificent but it’s also so charming. It’s perfectly petite and easy to imagine living a life there. My favorite bits are the central staircase, and the view toward the back garden from the upstairs windows. 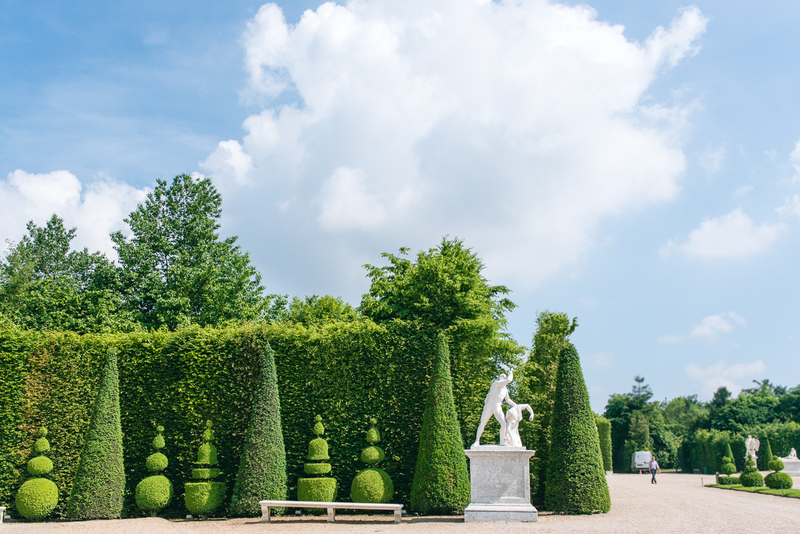 If you think the Petit Trianon is charming, just wait until you explore the surrounding gardens! Designed mostly in the Romantic English style, they’re completely different from the grand, geometric style of the main garden. Marie wanted to create an intimate fantasy world around her. There’s a private theater, man-made lakes and river, an octagonal-shaped sun room called the Belvedere, hidden pathways, a sunken grotto, a miniature vineyard, a fantastical farm, and a Temple of Love. In fact, you can still visit some farm animals if you walk back far enough into the Hamlet, which are taken care of by a family who actually LIVES there as caretakers! (total dream job for someone!!) 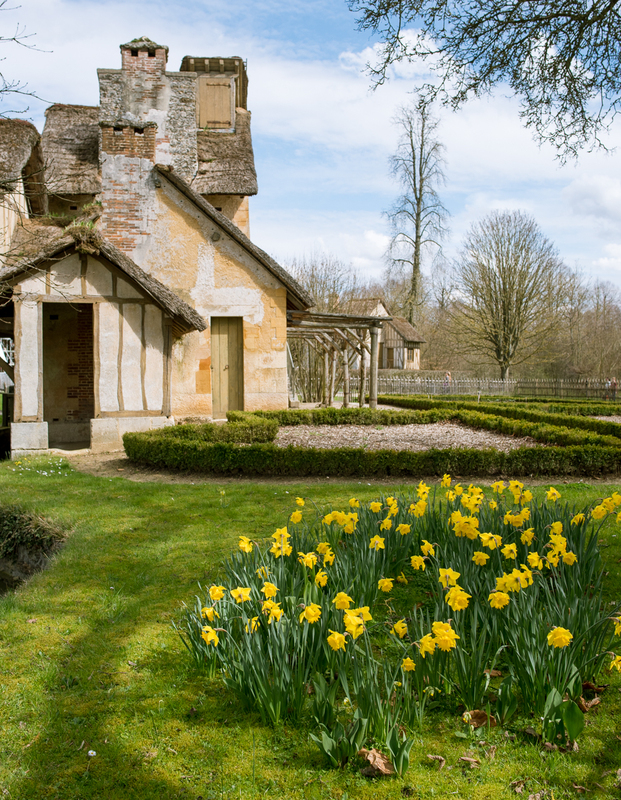 Read a bit more about the Petit Trianon gardens here: Marie Antoinette’s Garden During Spring. As the name suggests, the Grand Trianon is a bit larger and more stately than its little sister next door. There’s a lot of beautiful decorative art (furniture, paintings, rugs, etc), as well as a garden and pink marble colonnade. 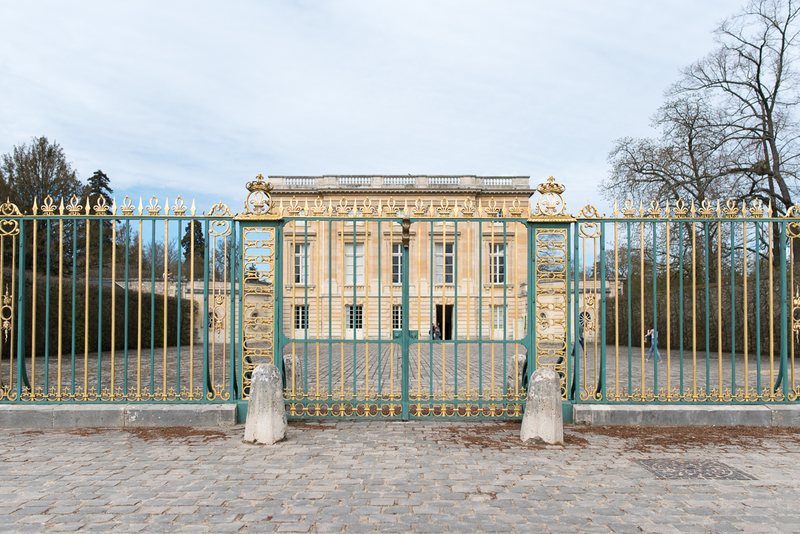 The gardens of the Petit Trianon connect to the gardens of the Grand Trianon, which is my preferred way to get between the two. After you’re finished with the Trianons, make your way toward the Grand Canal. Walk to the center of the cross where the arms of the canal meet, and you’ll then be able to see the main chateau in the distance. This stretch of grass is the perfect spot for a picnic. I would sit close to the boat rental station and the big cafe called La Flottille. Just find a patch of grass and enjoy your picnic! If, however, a picnic is not in your plans, you can get a bite to eat at La Flottille or a second little cafe nearby, although I have to warn you the quality of the food is mediocre. The ambiance is charming but don’t expect high quality food. 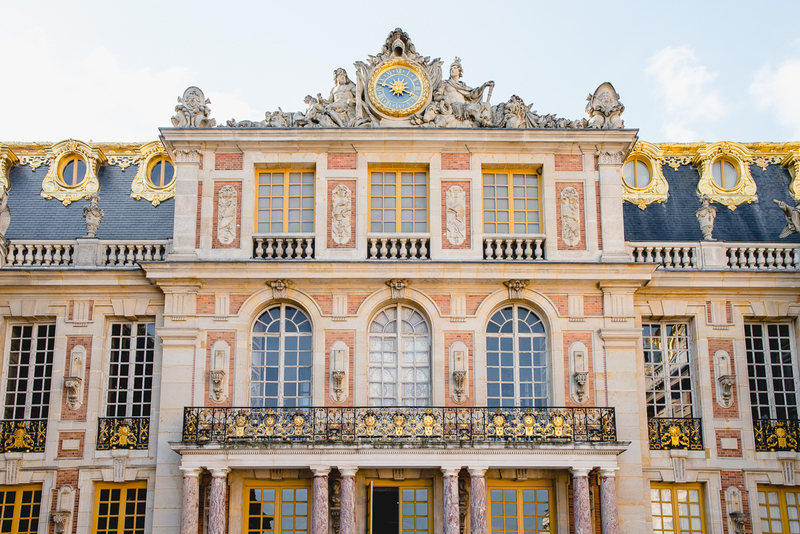 Now here’s where we get to the the scenery that you typically associate with Versailles – tall, perfectly sculpted hedges and topiaries, white marble sculptures, wide promenades and majestic fountains. If you happen to visit on a Musical Fountain Show day, be sure to pick up a guide so that you can plan your route through the garden according to the fountain schedule. The chateau is super ornate and visually overwhelming inside. The amount of wealth on display is astounding, and it’s so fascinating to think about how it was, in some ways, the embodiment of the French Revolution. Too much wealth and power in the hands of too few men, The royal court of Versailles lived in a completely separate universe from the common people of France, and it’s so apparently clear when you visit how easy it would be to be entirely enveloped into this world of marble and gold. On busy days, the smaller rooms inside the Chateau can get unbearably crowded. There was one time I felt like an actual sardine. It was so crowded that my body was physically touching other people on all sides and all I could do was shuffle through and try to not have a panic attack. So if you have problems with crowds, you might want to consider skipping over the main chateau. There’s no shame in it! The very last thing you can do is explore the Saint Louis District, which is one of the oldest parts of town. 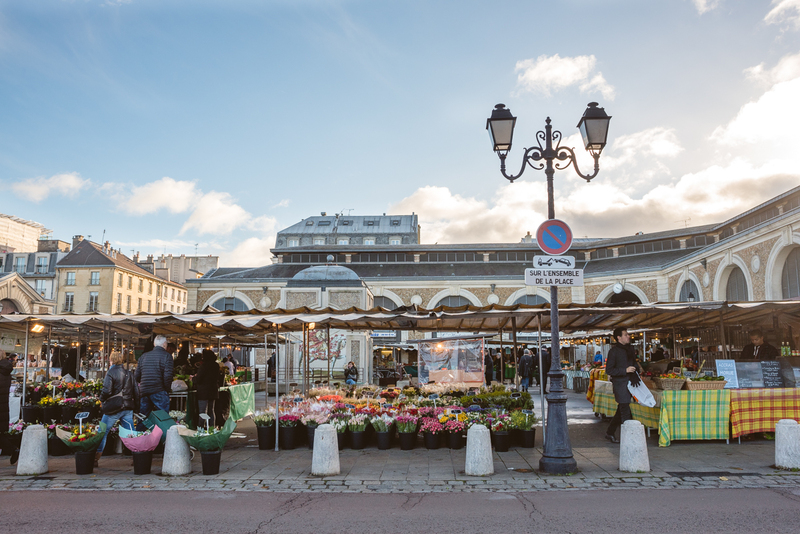 I didn’t include a walking route of this area on the map below, but feel free to grab a bite to eat along Rue Satory, check out the Baroque Saint Louis Cathedral, and/or The Potager du Roi. Last, but certainly not least, I’ve created a custom Google map! It has a walking route as well as all the sites marked that I mentioned above, plus I’ve marked some of the best places to grab a bite to eat or coffee. Open this map up in a new webpage on your computer using the little crop symbol in the top right. Select the box that says “Export to a .KML file” and press OK.
Email this file to yourself. Now get your phone. Download the Maps.Me app. It’s free and an awesome travel tool. Then, open up the email you sent to yourself, and press and hold that .KML file to open the file in the Maps.Me app. The Walking route and all the bookmarks will be copied over onto the Versailles area that you’ve already downlaoded, and it can all be viewed offline. Elephant d’Argent. The best Thai food in Versailles! The service isn’t stellar but if you have a craving for some spicy coconut soup or red curry, this is where to go! On the weekends we’ve sometimes had to make reservations because they fill up fast. Open for lunch and dinner, but closed between 2pm and 7pm. 6 rue des 2 portes, 78000 Versailles. The most popular train station, Versailles Rive Gauche, is served by the RER C train line. It runs pretty slowly and takes about 35-40 minutes from Paris. When heading back to Paris, don’t worry about which train platform to leave from, since all of the trains that depart from this station go through Paris. Below is a map of the RER C that I’ve modified to only highlight the portion of the network that you’ll be concerned with. 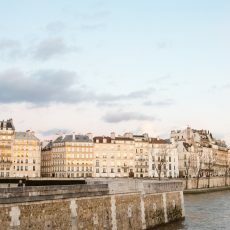 It runs right along the Seine River in Paris and can take you too the Eiffel Tower, Musée D’Orsay, and Saint Michel Notre Dame, among others. Click to open larger in a new window. The other train station that I mentioned in my itinerary is Versailles Rive Droite. It is accessible from Transilien Ligne L. Once again, I’ve highlighted the Paris-Versailles portion of the line. Occasionally you may be able to catch a speedier train that skips over some of the minor stations between, but generally, budget about 35 minutes on this trip as well. The third station in town is called Versailles Chantiers. It’s the furthest away from the chateau. The train lines that serve this station are: the RER C, Transilien Ligne N and U. Check out a detailed, interactive map here. If you’re lucky or you’re an excellent planner, you can catch a super speedy direct train from Montparnasse that only takes 12 minutes!! Hannah, this is wonderful! Thank you for taking time to write, share…. all the fabulous details. 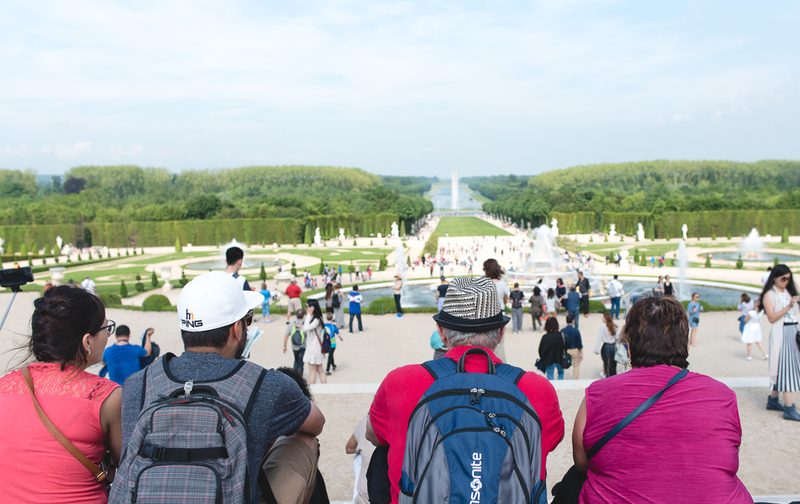 Your help was invaluable when we brought our SoulStrolling group to Versailles for the day. From your tips on train travel, the market, entering a different way for a picnic in the gardens. Merci beaucoup. 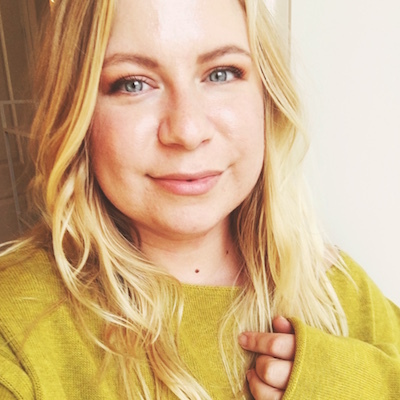 I think this is the best blog you have done so far! Thank you for this work! I am sure it must have taken you a week. 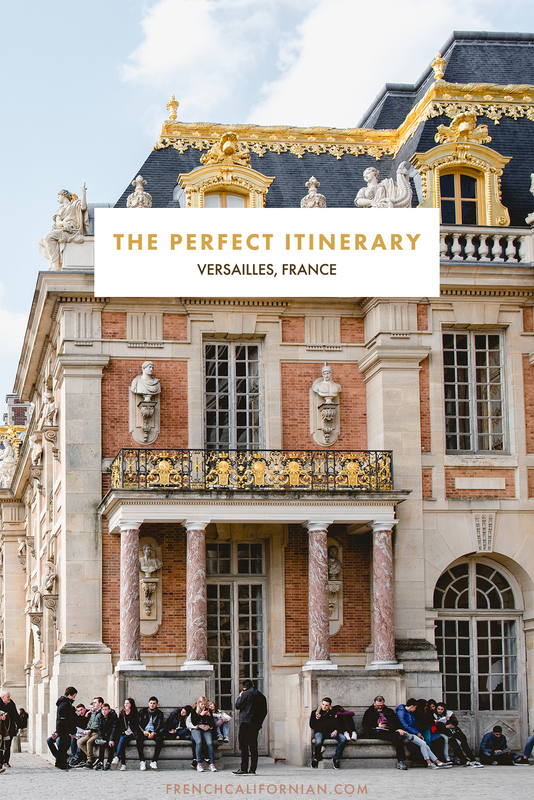 We are going back to France in September and I can tell you that this blog will be our guide for Versailles! Thank you for taking the time to read and recognizing how much thought I put into this! I stayed up until 2:45am last night working on it! :) It has been on my “to-write” list for so long. I’m glad I finally got it out there! I hope lots of people can benefit from it. Enjoy your trip to France later this year! Would you have any insights on the “Passport with Timed Entry” ticket option? I would love to do this one to be able to get inside within half an hour, but am concerned – what if I miss my time and show up later in the day? I understand I would not get the quick entry and would have to wait in the longer lines, but just want to make sure that the ticket is still valid for that day. Thanks! Unfortunately I don’t have any first-hand experience with the timed entry ticket – and looking through the website, I don’t see any information about what happens if someone misses their entry window. To be safe, I would assume that the ticket would then be invalid, but I can’t say for sure. Sorry I can’t be of more help! My suggestion is to contact the ticket office, or the Versailles tourism office and they should have an answer. Your blog has a great itinerary, my Daughter and I will follow your route in April. Approximately what time would you be arriving at the main Chateau? Do you know what time the Musical Fountain Show begins in the Gardens? Would assist me in making my itinerary for this day. Once again, thanks for writing the blog…very helpful!